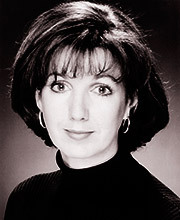 Geraldine Fitzgerald ’s theatre work includes seasons with the RSC and many productions at the National Theatre including Napoli Milionaria, The Merry Wives of Windsor, and Absolute Hell. Rep work includes A View From The Bridge, Guys & Dolls, and The Rise and Fall of Little Voice; and in the West End: The Lady in the Van, and An Ideal Husband. TV credits include Chalk and Crossroads and she has done numerous broadcasts including a year with the BBC Radio Drama Company.